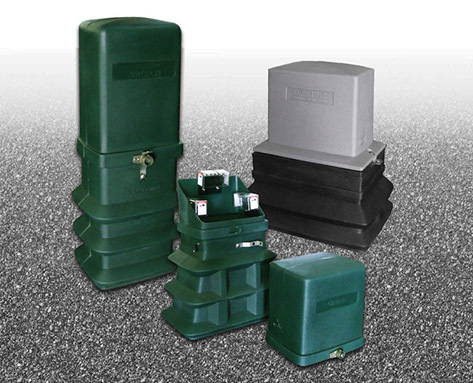 Armorcast Products Company offers a complete variety of Pedestal products. Technology, engineering, detailed design, durable material formulation are all part of the product quality and endurance of our pedestals. UV RESISTANCE / Elite blend of polyethylene material with UV inhibitors. Material formula has exceptional weatherability and durability characteristics as well as high enviromental stress crack resistance. PERFORMANCE / Superior tensile and impact strengths at both ambient and sub-zero temperatures. Unique structural design provides added strengths and stability. Special vandal resistant features. PRODUCTION / Ground line and/or logo molded into base. Penta-head lock assembly designed for use with customer installed padlock to provide double locking security. Pebble grain finish enhances appearance and richness. Specified connectors are protected with a clear cover and attach cable to a vertical adjustable mounting arm. Tamperproof, internal locking, temporary power service windows. Molded labeling and colors available.